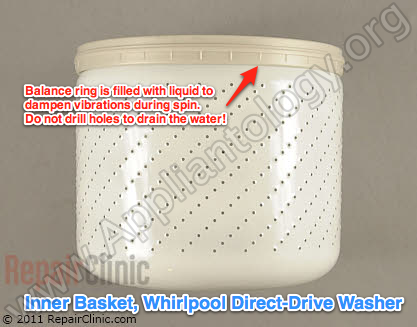 What’s that heavy plastic ring filled with liquid on top of the inner basket in a Whirlpool / Kenmore washer? The Inner Tub or basket has a heavy plastic ring at the top of it that is filled with liquid. Is this there for counter balance of some sort or has a seal failed and alowed water to enter. Not sure if I should drill a hole to drain this out or not. Thanks for the help. Don’t do it! That’s the balance ring and the fluid is intentionally put in there to help dampen the machine’s vibrations during spin. This entry was posted in Washer Repair on April 19, 2012 by Samurai Appliance Repair Man.